Staff of the Arden Theatre Company in 1995 celebrating their recently purchased home. The building is at 2nd and Arch, in the Old City neighborhood. I always enjoy stories about the arts sparking neighborhood revitalization. John Timpane, of the Philadelphia Inquirer, recently covered one from the City of Brotherly Love. “There’s a lot of turnover in the theater world, many an entrance and exit, so the Arden Theatre Company’s 30th anniversary this season is a testament to clear vision, luck, a lot of work, and even more talent. “But this story embraces more than a theater – it’s about a neighborhood, Old City, that in part revitalized around the Arden, and how an arts venue plays a potent role in such transformations. 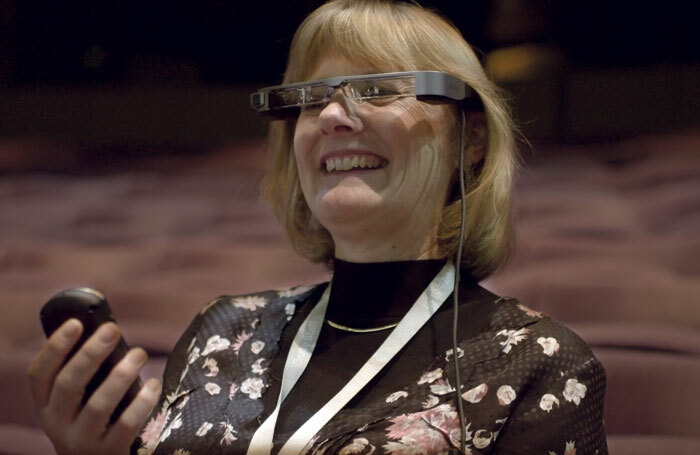 Open Access Smart Capture’s glasses enable deaf theatergoers in Britain to read live captioning during a performance. Earlier this month I posted about how the Vienna State Opera provides captions in six languages. Today’s entry is on making dramatic productions more accessible to the deaf by means of glasses that churn out captions. Georgia Snow writes at the Stage, “The National Theatre has unveiled new technology that will enable deaf audiences to see captions for performances in front of their eyes using special glasses, … removing the need for captioning screens in the auditorium. “Developed by the NT with its innovation partner, consultancy firm Accenture, Open Access Smart Capture is being introduced during a year-long pilot. “He added that ProFile also hopes to remove some of the barriers for deaf and disabled performers, for whom travelling to auditions and meetings can be difficult and expensive.” More at the Stage, here. If nothing the else, the glasses will be fun. A few years ago, I got to see that for myself using Google Glass. An executive where I worked was having summer interns play around with programming the glasses to test the possibilities for the Fed. That didn’t go anywhere, but it was definitely fun. A scene from “Mentiras Piadosas,” by the troupe Los ImproDucktivos. That’s the audience watching from behind the Venetian blinds. Theater people keep thinking up new ways to create work that moves you in an immediate and intimate way and that attracts new audiences. We’ve written about theater in taxis in Iran and dramatic productions conducted one-on-one, among other experiments. Now from Spain comes micro theater, 10-minute plays that allow you to stand in the same room with the actors. 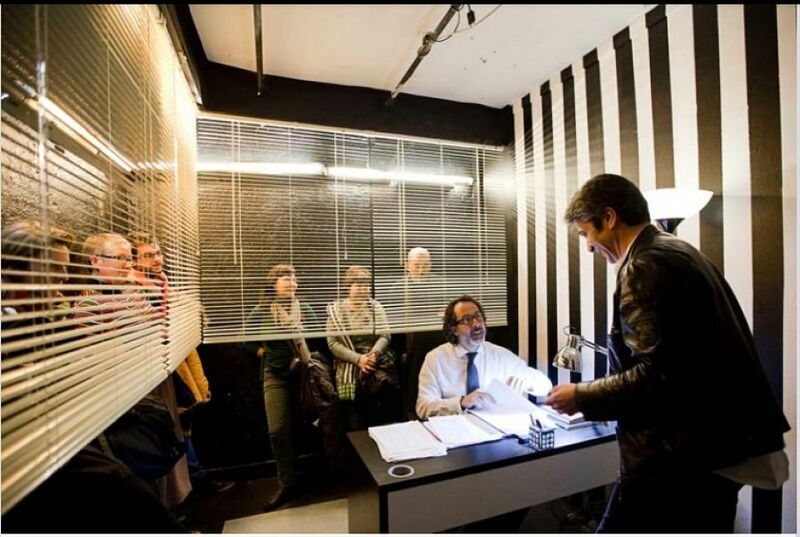 Felicity Hughes writes at American Theatre, “On a rainy Thursday night in Madrid the bar of Micro Teatro Por Dinero is packed with a young crowd of theatregoers waiting to catch a short performance in one of the five tiny rooms in the venue’s basement. When our number is called, we’re led into a small dark room where the audience sits pressed up against each other sardine fashion on tiny stools. A door is flung open, immediately breaking the fourth wall as a distressed young man stumbles in and sits down on my knee in floods of tears. “ ‘You feel as if you’re breathing alongside the public and they’re breathing with you,’ says [Juan Carlos Pabón, a Venezuelan actor]. ‘We’re dealing with a lot of emotion inside a scene and a lot of attention. There’s not as much artifice, so it’s a tough discipline; the public are really concentrating on you, and notice the good along with the not so good.’ ” More here. The director in Miami says audiences seem to prefer comedies to dramas. I can see why. If you are going to be that up close and personal with strangers, you probably want keep things light. The newspaper’s Darryn King writes, “On a recent Friday night in Manhattan, around 20 people and one terrier gathered in the living room of an Upper East Side apartment to listen to a string quartet perform Beethoven, Ravel and Tchaikovsky. 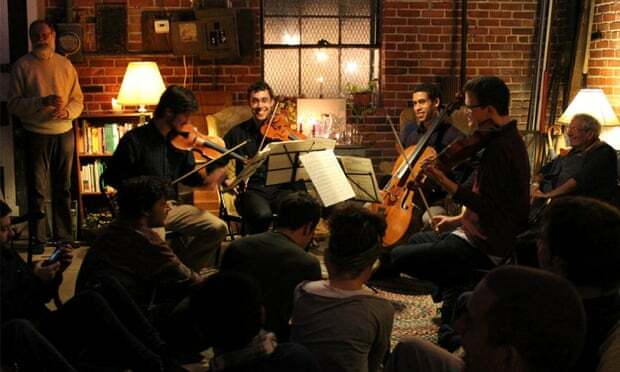 “There are similar events to this performance, organised by Boston-based chamber music concert community Groupmuse, happening in New York, San Francisco and four other cities every week: intimate shows taking place in living rooms of all shapes, sizes and levels of cleanliness, a paradoxically homely and exciting alternative to traditional theatres, concert venues and comedy clubs. “And it isn’t limited to classical music. Thanks to a range of organisations putting on events in the home, there’s a good chance that, if you were so inclined, you could enjoy standup comedy, live theatre and rock gigs in the comfort of someone else’s residence tonight. Welcome to the latest and greatest nontraditional venue invigorating the city’s live performance scene: the humble living room. 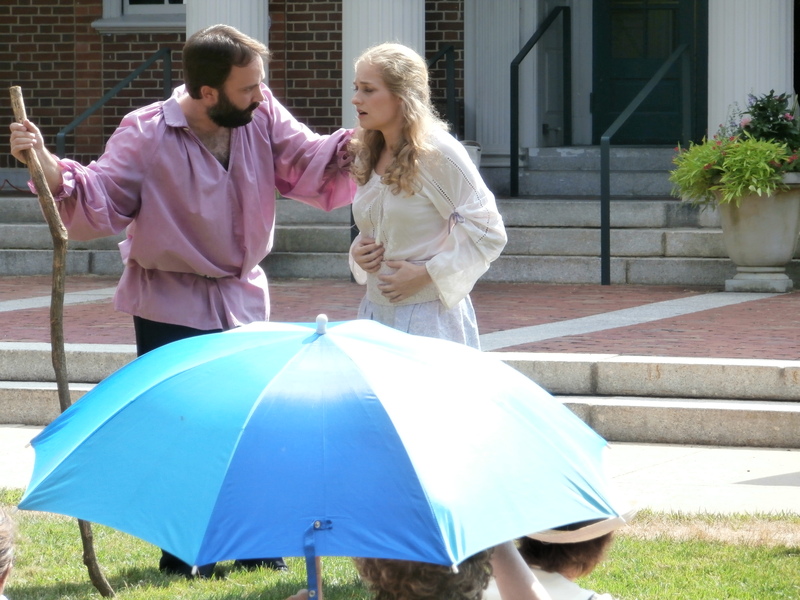 “The New Place Players, a troupe of Shakespearean performers-for-hire, have also been busy immersing audiences. The group has staged their productions of Twelfth Night and A Midsummer Night’s Dream in homes all over the city, while also putting on regular supper-and-show performances in the sumptuous living room of the historic Casa Duse residence in Park Slope, Brooklyn. “The productions are a harmonious blend of music, lighting, theatre, food and drink, amounting to a communal atmosphere that harks back to the experience of catching a theatre performance in Elizabethan times.” More here. 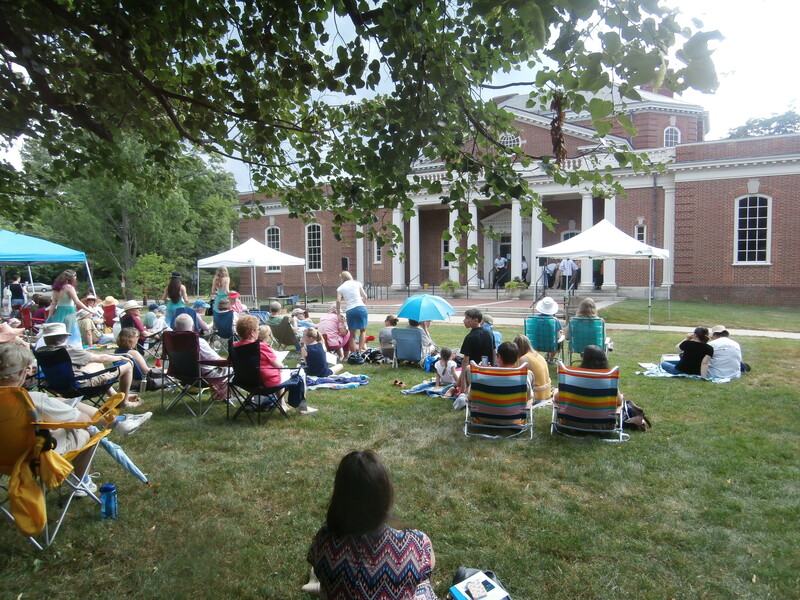 The Concord Players brought a one-hour version of Shakespeare’s “The Tempest” to the lawn of the library yesterday. 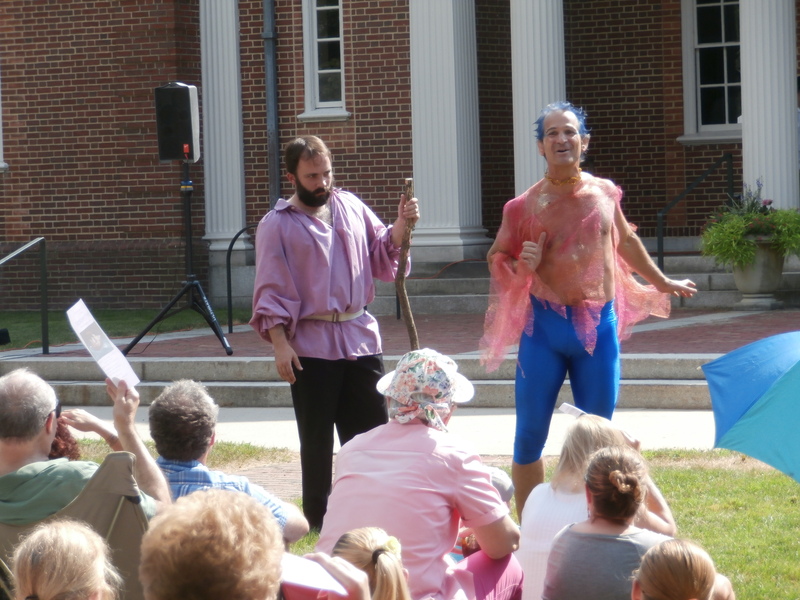 The Prospero was perhaps too young, considering that “The Tempest” is an aging Shakespeare’s valedictory, and there was some awkward overacting, but gee whiz, they had to shout to be heard outdoors. 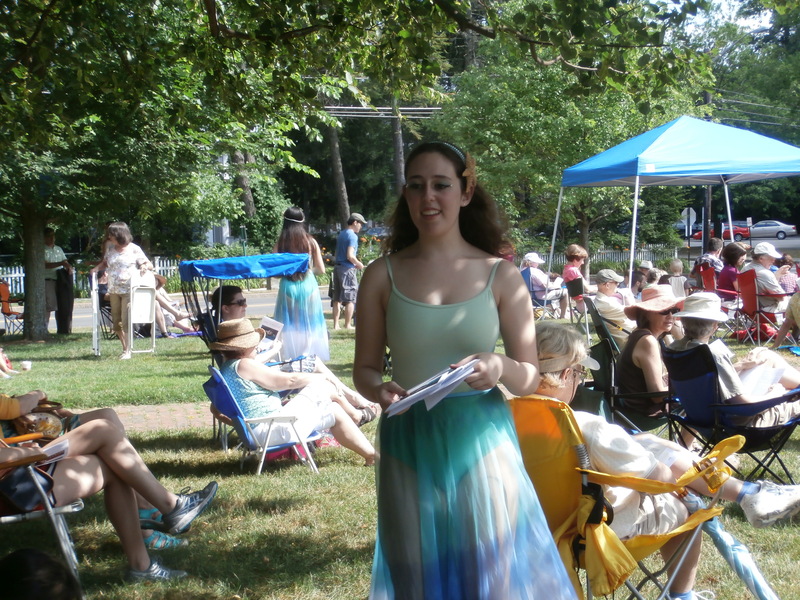 So, good for them to work so hard to give the public free theater in summer! Several sea nymphs doubled as ushers and were lovely to behold. John sent me a good New Yorker story about “the Arslanköy Women’s Theatre Group, an all-female theatre group, based in rural Turkey, which is writing and performing plays. “Ümmiye Koçak, who is now in her mid-fifties, was a forty-four-year-old farmworker with a primary-school education when she caught the theatre bug from a school play that a local school principal, Hüseyin Arslanköylü, had staged the previous year,” writes Elif Batuman. “Ümmiye had never seen a play before, and it seeped into her thoughts. For a long time, she had been puzzling over the situation of village women and the many roles they had to play. In the fields, they worked like men; in villas, they became housekeepers; at home, they were wives and mothers. “In 2000, with other women from her village, Arslanköy, she formed the Arslanköy Women’s Theatre Group. The group met every night at the school, after the women had worked ten- or twelve-hour days on farms. Their first production, a contemporary Turkish play called ‘Stone Almonds,’ sold out a theatre in the provincial capital of Mersin, and was written up in the national press.” Continued here. Still more at the New Yorker blog, here. “Hamlet” performed in a mountain location near Arslanköy at dawn.